Each individual petal is cast separately and then applied by hand to create the orchid. ;Due to the delicate nature of the design, each mold can only be used to make 30 teapots before it is retired. ;The handle on the tea cup is an extension of the stem. ;Each set includes 4 tea cups, 4 saucers, and one 32 oz (945 mL) teapot. ;Dishwasher safe. 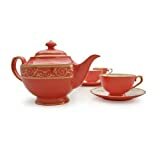 This brilliant red bone china tea set features a timeless design blending passionate red with a delicate filigree swirl and leaf motif. Lustrous red glazing is a unique art form accomplished only by the finest manufacturers in China. Teavana Exclusive. 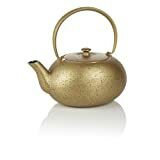 Brew your prized loose leaf tea with ease in the stylish The de Chine Teapot with glass infuser. Just put the tea into the infuser , add hot water, and let the tea steep to your liking. Because The de Chine is all glass, you can see the tea brewing, which allows you to let it steep just to your liking. Once it has finished brewing, just remove the infuser and serve. The lid acts as a trivet for the used infuser to eliminate drips on your table or countertop. The de Chine is made from heat safe borosilicate glass. The 2 cup size is 16 ounce and yields 2 - 8 ounce cups of tea. 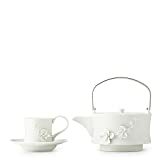 Keep your dinner set pattern going with this Corelle Coordinating whistling teakettle in the cherry blossom pattern. 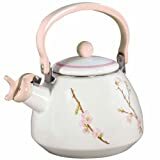 This enamel-on-steel whistling teakettle will hold up to 2-1/5-quart and can be used on gas or electric stove tops. GR 202 Features: -Classic and elegant design comes with removable infuser that can be used to steep loose leaf teasse teas and spices. -Heat safe. -Material: Highest quality medical grade borosilicate glass. 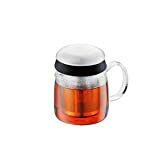 -Capacity: 42 Ounces makes up to 4-5 cups of tea. Material: -Glass. Number of Items Included: -1. Base Material Details: -Borosilicate glass. Dimensions: Overall Height - Top to Bottom: -8.25 Inches. Overall Width - Side to Side: -8.5 Inches. Overall Depth - Front to Back: -7.25 Inches. Overall Product Weight: -1.7 Pounds. Diameter: -7.25 Inches. Handle Depth: -8.5 Inches. 5 Piece unity tea pot set. Matching 4 oz cast iron cups. Matching 5.3'' cast iron trivet, 8 x 12 bamboo serving tray. 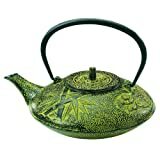 Pour boiling water into tea pot over tea leaves or bag which are in the stainless steel insert. HI's mesh snap ball tea infuser makes it quick and easy to steep a fresh, more distinct and flavorful cup of loose leaf tea with the same ease and convenience As using store-bought tea bags. Simply squeeze the spring-action handle to open the snap ball. Fill the ball halfway (about 2-teaspoons) with loose tea to allow the tea Leaves room to fully expand. Place the infuser, ball end down, into the cup and pour in hot water. 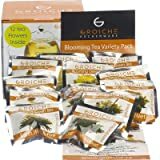 Steep no less than 3 minutes to release the naturally occurring essential oils in tea and maximize the infusion With aroma and flavor. Once desired brew strength is achieved, remove the infuser from the cup and discard the used tea Leaves. Great for making mulled cider, too. Just fill the infuser with mulling spices instead of tea. 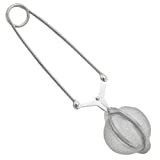 Made from 18/8 stainless steel, his's mesh snap ball tea infuser is reusable and more economical than using store-bought or single-use disposable tea bags. Compact to store away easily. Easy to fill and empty. Just rinse clean or pop it in the dishwasher.